The 2012 London Summer Olympic Games arrived and London bled purple. The world’s best athletes have come together and among those are TCU’s Edgar Crespo and Sarah Scherer. 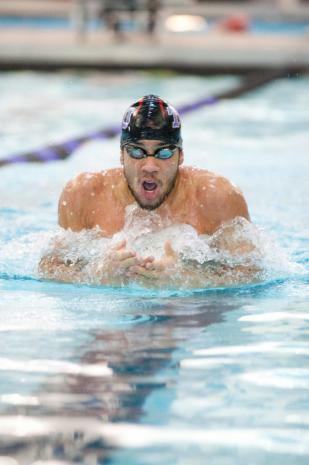 Junior Edgar Crespo swims the breast stroke against Utah in 2011. Photo by Multimedia. Editor Matt Coffelt. Four years ago, Edgar Crespo competed at the Olympics in Beijing for the first time. Since then, Crespo trained in preparation for the moment that many athletes only dream of- competing for their country in front of the world. “I mean anything can happen, so I will do my best as I always do and swim as fast as I can, so I can reach the goal I have right now,” Crespo said before the competition. Crespo competed at the London Games in the 100-meter breaststroke representing his home country, Panama. Crespo placed fourth in his heat at the Olympics. At TCU, Crespo holds the record in both 100-meter and 200-meter breaststroke. “TCU has been my second house, my second family, so it’s almost the same feeling that I have representing Panama,” Crespo said before the competition. The 2008 Olympic Games in Beijing were a great experience but now the proud Panamanian and Horned Frog felt ready for the London Games, he said. Bill Koppelman, assistant coach for TCU Swimming and Diving, joined Crespo at the Olympics as Panama’s assistant coach swimming and diving coach. Koppelman joined the TCU swimming and diving team as an assistant coach in the fall of 2006. He has trained with Crespo for four and a half years and is coaching at the Olympics for the first time. Koppelman said Crespo is a dedicated and humble person that makes coaching easy for him because he is a hardworking athlete. For Koppelman, coaching comes first and after Crespo’s event, he looks forward to observing and learning the most that he can, watching swim meets and supporting the other Panamanian athletes. Koppelman also had the opportunity to work with another Olympian, Alejandro Gomez during his first year coaching at TCU. Gomez, who is a TCU graduate, competed in the long distance swimming competition for Venezuela at the London Games. He trained in Florida with another TCU alum, Gregg Troy, who is the head coach for the men’s swimming and diving team. “When we’re sending multiple people to the Olympics, including our alumni, that’s definitely something we can hope to build upon and hopefully get some more in 2016,” Koppelman said. These Frogs will compete in the 2012 London Summer Games. Senior Sarah Scherer competed in the 2012 Olympics and placed seventh out of eight athletes in the women’s 10 meter air rifle event. Scherer is a NCAA Champion with many rifle honors as a part of TCU’s rifle team. Scherer shot a perfect 600 against the University of Alaska-Fairbanks last fall, an accomplishment she said she did not expect at this point in her career. TCU Coach Karen Monez said Scherer was the fourth person in NCAA history to attain a perfect score and the second woman to do so. TCU’s Edgar Crespo placed fourth in the men’s 100 meter breaststroke representing Panama. Crespo holds the TCU record in both the 100 meter and 200 meter breaststroke. He competed in the 2008 Beijing Olympics and in the Pan-American games this past fall. TCU graduate Alejandro Gomez will swim for Venezuela in the Olympics this summer. He swam the men’s 1500 meter freestyle in 15:24.29 placing third. He previously held the TCU record for the 1,000 meter freestyle. Gomez will compete on Aug. 3. TCU graduate Khadevis Robinson earned a place on the U.S. team for the London Games with a time of 1:44.64 as a runner-up in finals of the men’s 800 meters. He previously placed first overall with a time of 1:45.83 in the semifinals of the men’s 800 meters. TCU graduate Justyn Warner will compete in London for Canada in the men’s 100 meters. He placed first overall in the men’s 100 meters at the Canadian Track and Field Championships. His time was 10.15 seconds. The three time All-American finished third overall at the Mountain West Conference Championships in 2009 and qualified for the NCAA Regional. TCU graduate Darvis Patton will run in the 4×100-meter relay for U.S. In 2000, he became the first TCU athlete to win an indoor conference long jump title and the first Horned Frog to win a conference long jump crown of any kind since 1970 when he won the WAC indoor title. The ten time All-American graduated from TCU in 2001. Former Frog Gregg Troy is the head coach for the men’s Olympic swim team. Troy graduated from TCU in 1972 and is currently the University of Florida head coach. Bill Koppelman is the assistant coach for Panama’s swimming and diving team. Bill Koppelman joined the TCU staff as the assistant coach for TCU Swimming and Diving in the fall of 2006.